This is an analysis of Robert Gordons’ trades, on cotton July 1927, from the book The tunnel thru the air . Robert buys 200 bales of cotton July ,on January 24th 1927 , at 13.8. 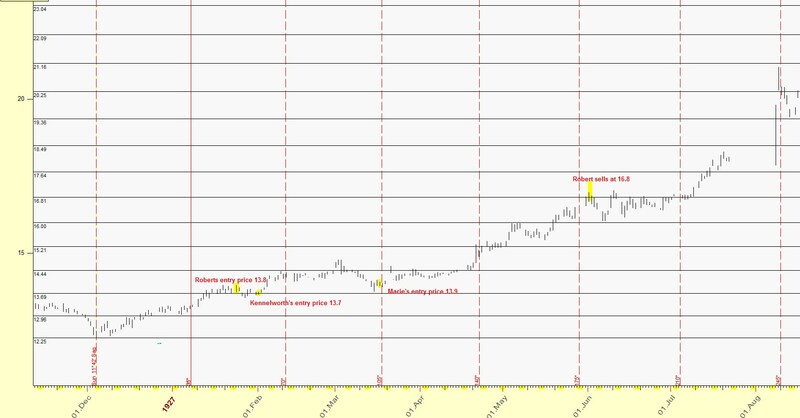 Gann mentions that on March 15th 1927, the price of cotton is 13.75. On March 17th 1927, Robert buys 100 bales for Marie, at 13.9. 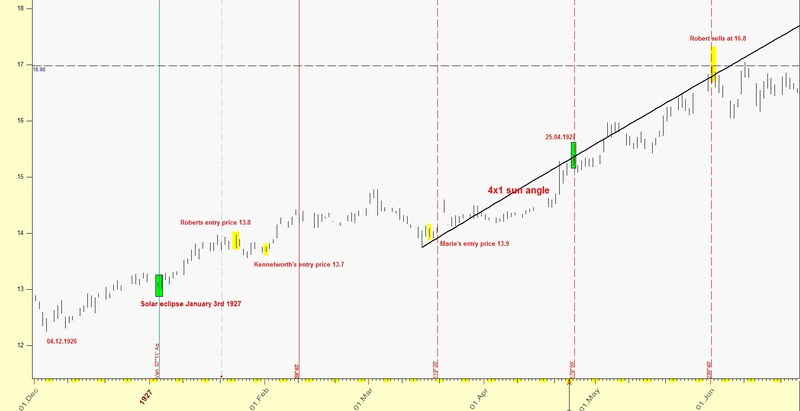 Gann mentions that on April 24th 1927, the price is 15.4. 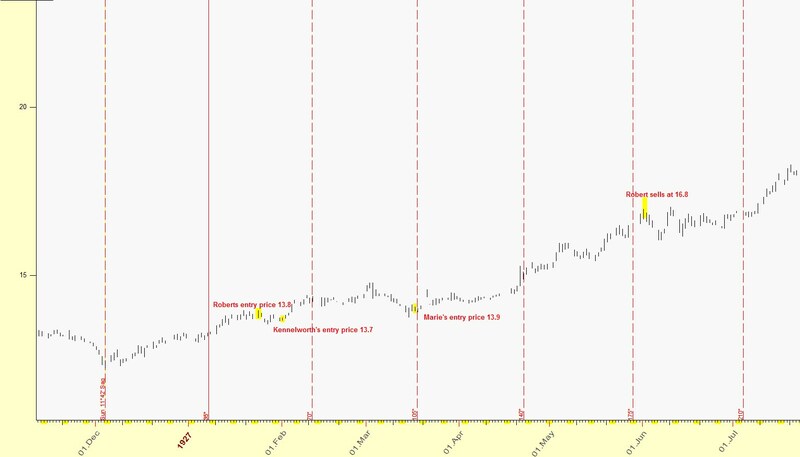 Gann mentions the profits they all had on May 7th 1927. 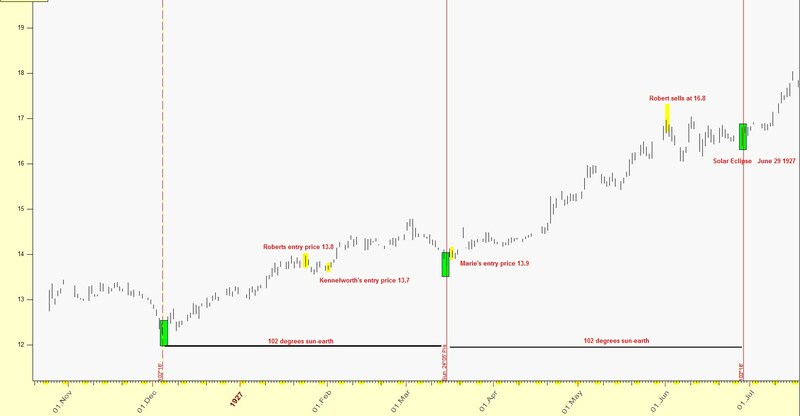 Gann mentions that the price of cotton on May 19th 1927 is 16. And, finally, on June 1st 1927, Robert sells at 16.8. 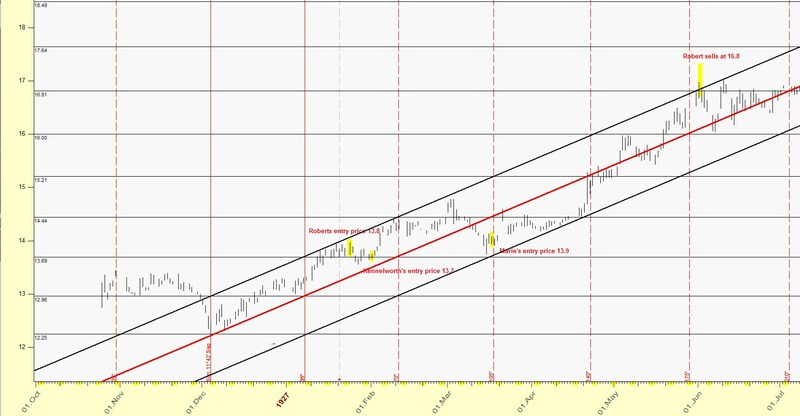 The above dates and prices are more than enough to reverse engineer Gann’s-Roberts’ set-up. 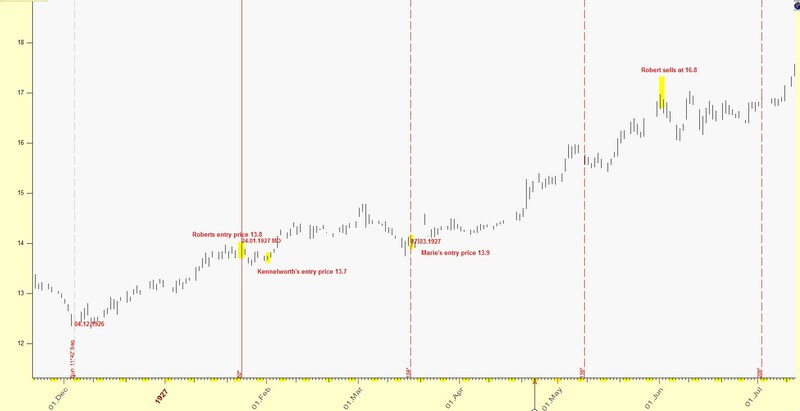 Starting with the low price of cotton July, 12.25 (1225=35 x 35) and combining it with 13.70 (Kenellworth’s entry price)=1370 =1369=37 x 37, and 16.8 where Robert sold (1680 =1681=41x 41 ), we can already see the pattern in price . Where 1/8th is 12.5% of 12.25 up, 2/8ths is 25% up etc. 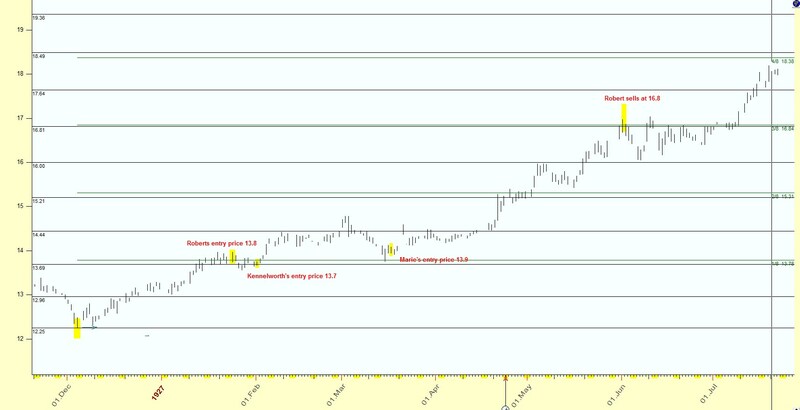 We get to see that nearly all ranges of the daily bars of the most important dates are within these levels. There are many interconnections between these prices and dates mentioned. From December 4th 1926 (low of 12.25) to January 24th 1927 (Robert’s entry at 13.8) the Earth travelled 52 degrees. From December 4th 1926 to June 1st 1927, the Moon travelled 2368 degrees, and Mercury geocentric travelled 209 degrees. 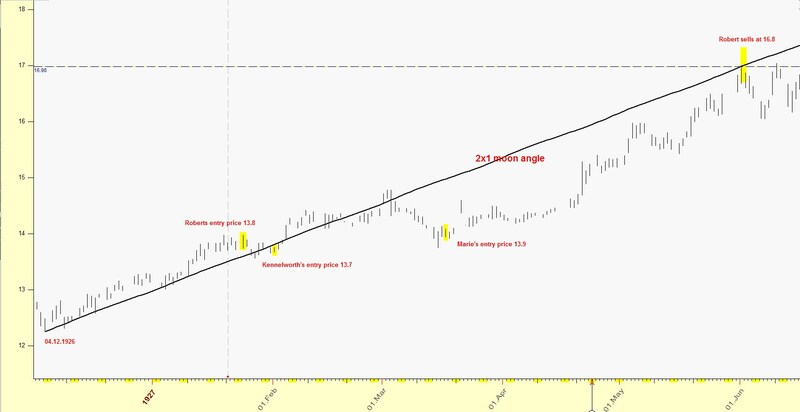 Two Solar Eclipses (SE) occurred in the time period we are analyzing: that of January 3rd 1927 and that of June 29th 1927. Counting forward, 90 degrees geocentric Venus from January 3rd 1927 (SE) gives Marie's entry date, and another 90 degrees gives June 1st 1927, where Robert sold. March 15th is half way from Dec 4th 1926 (Low,12.25) and June 29th 1927(SE). That is, 102 degrees of Sun-Earth degrees from March 15th backwards gives Dec 4th, and forward 102 degrees gives the SE day. So March 15th must be important. Going back to the low of 12.25, which occurred when the Earth was at 70 degrees, or 10 degrees Gemini, 70 is twice 35 and 35*35 equals 1225. We have left out April 25th. The price mentioned is 15.4. Here is where the angles take place, and more specifically, the planetary angles. 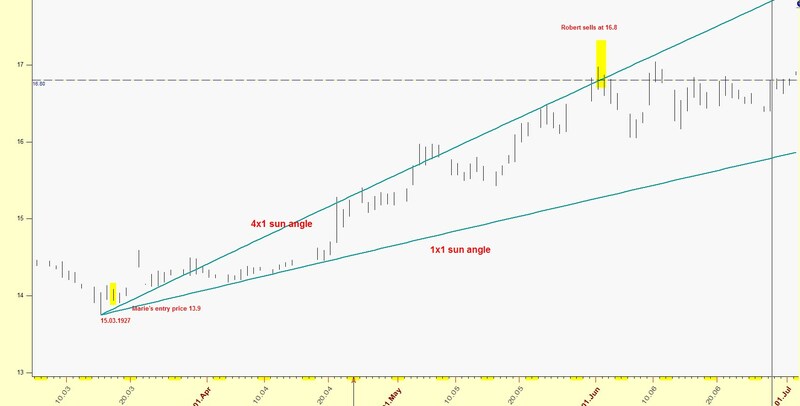 Using a Sun planetary fan with 1 degree equaling 0.01 points, the 4x1 angle from March 15th 1927 hits the price of 16.8 at June 1st 1927 (where Robert sold). And last, April 25th 1927. 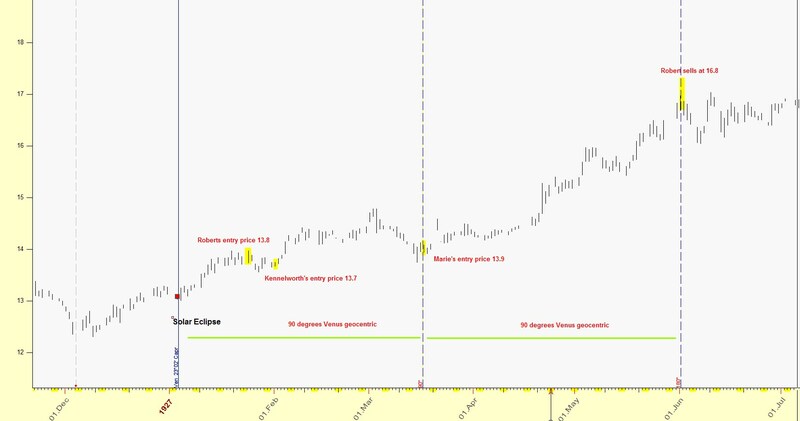 Secondly, April 25th 1927 plus 60 degrees of Venus heliocentric gives June 1st 1927, and 180 degrees backwards gives the Solar eclipse of January 3rd 1927. Also, it is 90 degrees of Sun-Earth, from Robert's entry day. 41-35=6 and 210 degrees divided by 6 equals 35 . 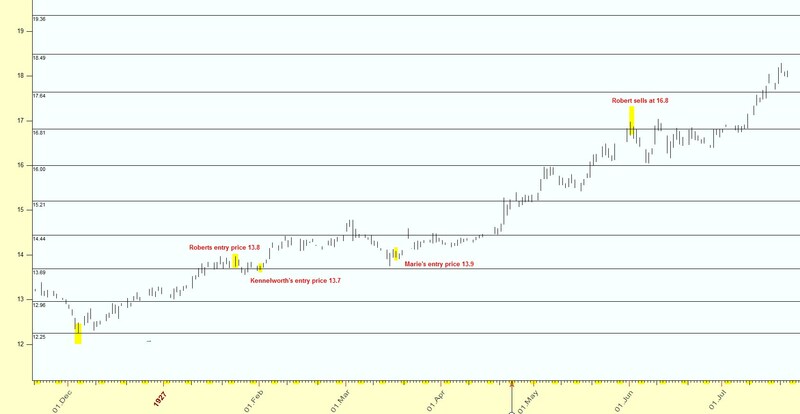 And 60 degrees Sun geocentric added from Dec 4 1926,gives Kennelworth’s entry date.